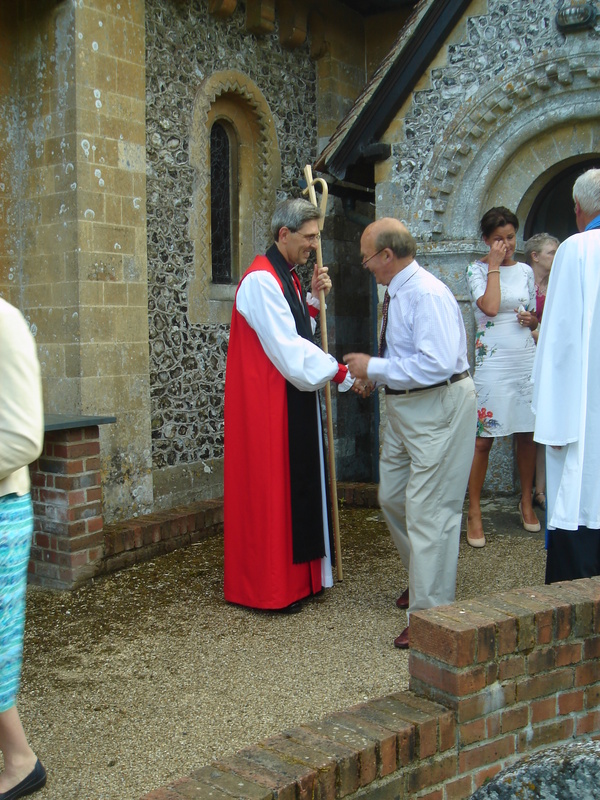 On Sunday night the Itchen Valley Parish celebrated the Patronal Evensong of St John’s Itchen Abbas. This is a service focused on the patron saint of one of our churches, in this case, St John the Baptist. 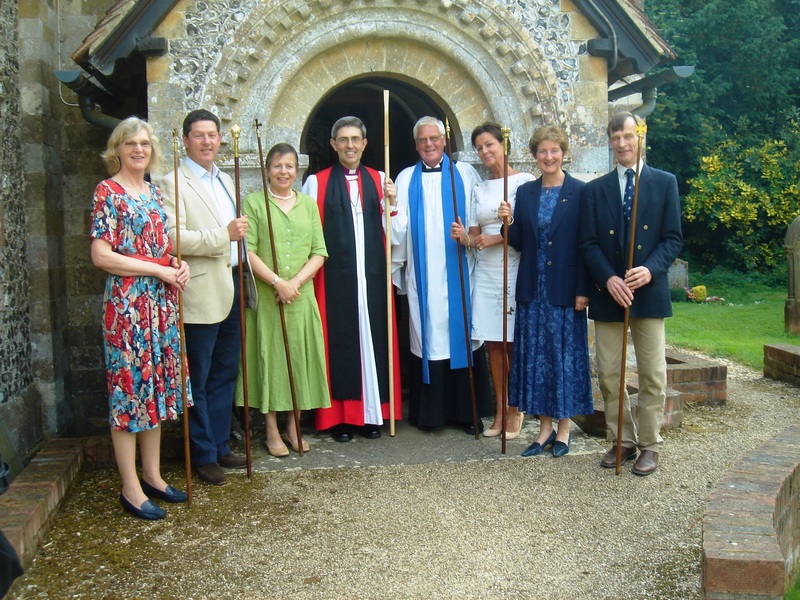 It seemed like a good occasion to invite our (relatively) new Diocesan Bishop – Bishop Tim Dakin. 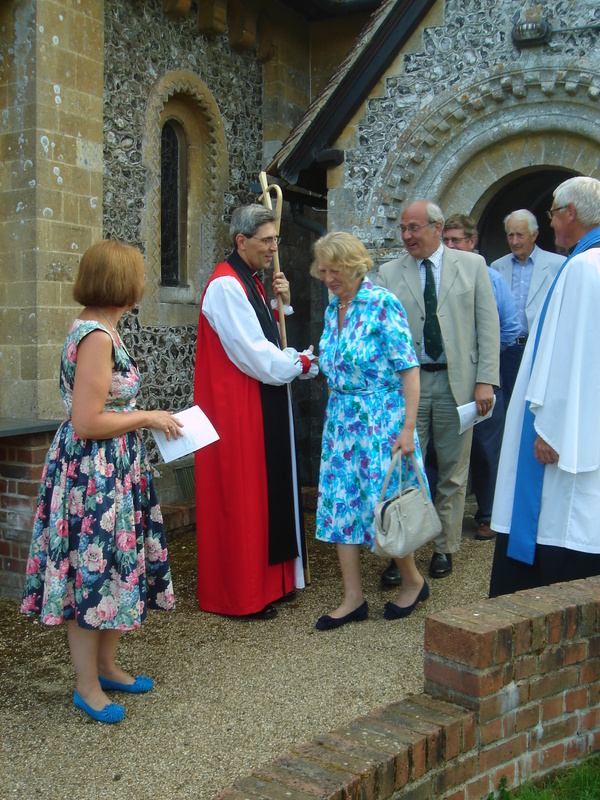 The church was almost full (the evening event inevitably precluding attendance by our many younger worshippers and their parents) and the service was led by our lay reader Tony Gaster celebrating that day 10 years as a reader – congratulations Tony! Our ad hoc choir beautifully through the canticles and a wonderful rendition of Mozart’s Ave Verum. After the service many of us had supper at Easton Village Hall – cooked and prepared totally brilliantly by so many people in the community and a number of people managed to talk to the Bishop. A really excellent evening and huge thanks to all those who contributed to its success. The principal reading at the service was Acts 13 vs 26: “Fellow children of Abraham and you God fearing Gentiles, it is to us that this message of salvation has been sent”. 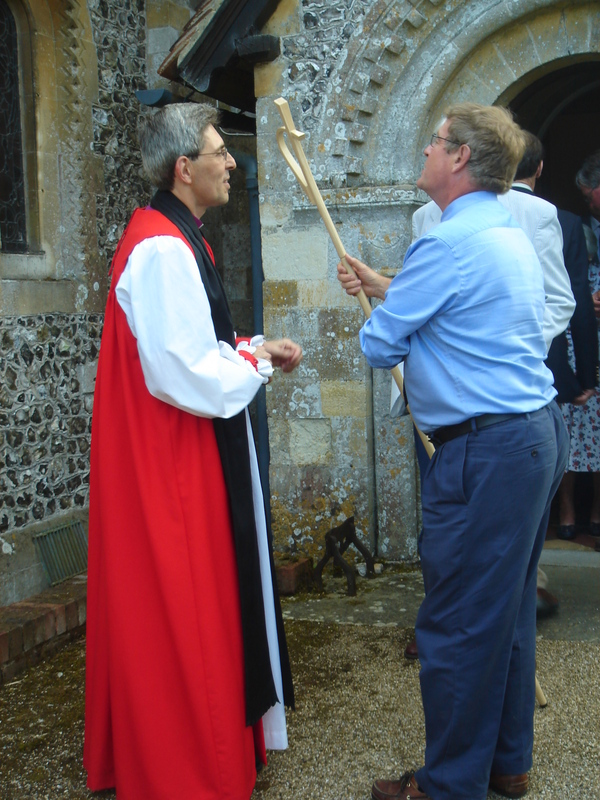 Bishop Tim started his address by asking us whether we could conceivably imagine England winning the World Cup again? He observed that it is hard for us to grasp what an impact Paul’s message would have had on his hearers. But perhaps we could get a glimpse of that impact from thinking about British sporting success (or the lack of it). As it’s almost impossible to believe that England could win the World Cup again, so for the Israelites, having Jesus come and speak of the Kingdom of God, so many hundreds of years after they had lost the kingdom of Israel, the idea must have been difficult to grasp also – too wonderful to imagine. Also hundreds of years after the last of the prophets, there came John the Baptist preaching repentance. Quite a revolution: John preaching repentance and Jesus preaching the kingdom. A bigger salvation than they could possibly have expected – not just for Jews but for the world – even bigger than the World Cup! Then the Bishop asked us (what we are calling the +Tim Challenge) what our summary of that salvation was. Could we explain the gospel to someone, who asks what we believe? When we have an ‘elevator moment’ – if someone were actually to ask us in the lift – ‘so you are a Christian – what do you believe?’ Could we put it succinctly, before the lift reaches the next floor? Could we do it as a tweet in 140 characters? Could we do it at all? He suggested (but did not claim it was 140 characters): “God creates & luvs a wrld of beauty yet there is evil, suffering & sin; Jesus lives, dies & rises, restoring creation as God’s Kingdm & gives us the Spirit to live his mission”. Bishop Tim said that it was our responsibility to share that gospel, that message of salvation, with other people and to help them understand what it means in every day terms – by living it out. He asked us what our vision was for the Itchen Valley? How did we intend to go on having an impact in our villages and in the wider culture? He mentioned that there was an opportunity to speak in our local schools about what we believe and the values by which we lead our lives and why we do so. The Kingdom of God makes no sense unless it is lived out. What were we going to do to live out the Kingdom of God in our own lives and context? He mentioned the mission strategy for the diocese – the Mission Action Plans that were being put in place throughout the deaneries. What simple things could we do to engage with our local communities? 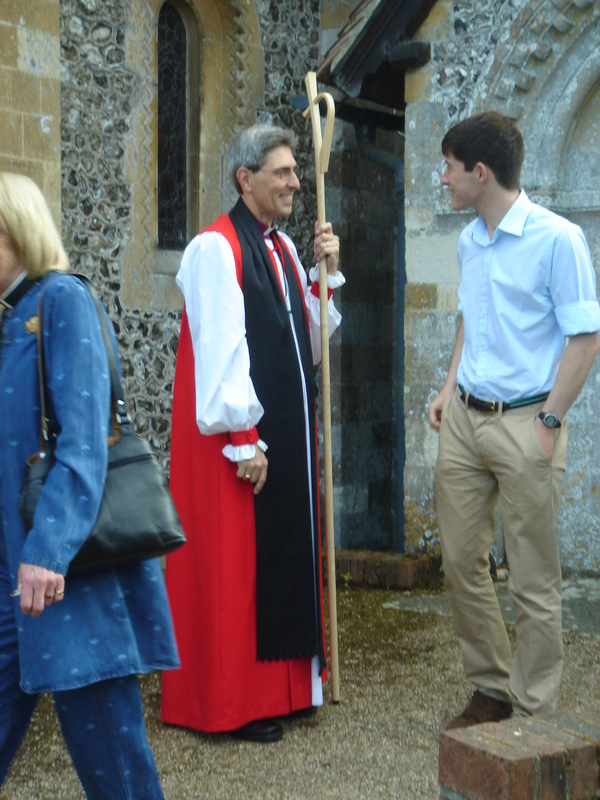 As we prepared for a new incumbent, what was our vision on how we would work out the mission of the Kingdom of God in our communities and further afield. He said that he was delighted to see in our Parish Profile the reference to St James’s Benwell in Newcastle Diocese. We are a privileged community in North Hampshire. To us the message of ‘this salvation’ has been sent. What were we going to do with it?